Abbey Wood wins £300k. Plumstead Doesn't. Will Abbey Wood Crossrail’s public realm improvements rapidly fail? Greenwich Council recently bid to improve three High Streets across the borough. Two have been successful – Abbey Wood and Eltham – whilst Plumstead missed out, seeing not a penny from two very modest £20k bids despite Plumstead crying out for some investment and suffering years of neglect. In total, Abbey Wood is to receive £300k and New Eltham will see £15.5k. The Abbey Wood bid is alongside Bexley Council. Under previous leader Chris Roberts, Greenwich Council missed out on many potential large sums of money to improve areas. Numerous funds were available from outside sources and yet time and time again Greenwich council didn’t receive any. For example, areas badly hit by the riots saw millions pour in, except areas in Greenwich. Were the bids poor? Were they even bidding? Were they pursuing some misplaced isolationist DIY attitude and concerned with protecting their ‘image’, despite many areas of the borough having a terrible image with many locals and visitors? Since Roberts left things seem to have picked up. 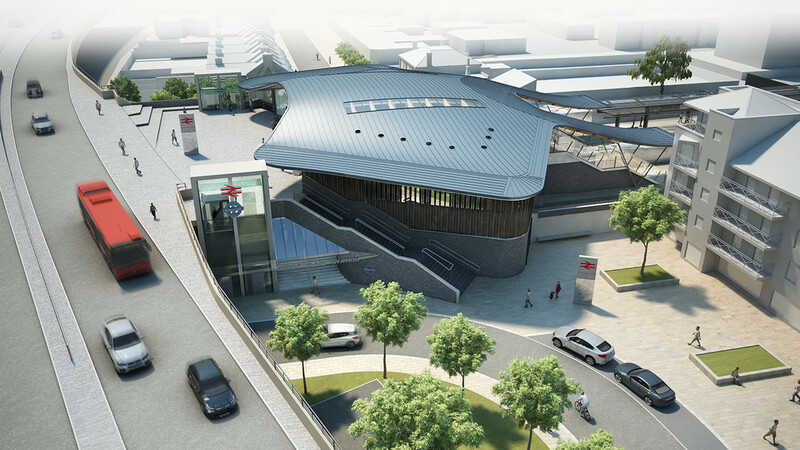 In the past few months Abbey Wood saw £6m awarded from Crossrail for public realm improvements around the station, though this was always on the cards as every station will see improvements. Unfortunately this bid ‘forgot’ to include the main shopping area in Abbey Wood directly next to the station, despite years of neglect and a promise for MANY years that improvements would come ‘soon’ with Crossrail. A pretty incredible oversight and you can’t help but wonder just what the councils were playing at. The £6m improvements are mainly on areas benefiting those walking or taking the bus from Thamesmead, not Abbey Wood residents. It’s hard to see how £300k will do all that. Though simple things would cost a pittance to do and never needed a bid to achieve. This includes removing the disused sign poles along the road along with the old phone box and putting in some half-decent street furniture. The street lights are poor, cheap and not good enough for a shopping parade. I would like to see trees along the wide paving (well, cheap tarmac in parts) yet instead there’s a bizarre suggestion of a market. There’s not the footfall. A better spot would be the other side of the new station where renders show a big new expanse of paving in a quiet area (where a big chunk of the £6m is going instead of Abbey Wood’s main shopping parade). Market here along with cycle parking on ‘dead’ space? A segregated cycle lane is shown. Hopefully this extends all the way directly along Harrow Manorway reaching the bridge across to north Thamesmead. There is mention of cycle lanes in the recent housing zones announcement. The question is what happens to the lane when it reaches the area by the station? The large expanse of paving close to the station could also accommodate a number of secure cycle racks. What’s currently planned is just new paving and nothing else. Given how people park there, and how Greenwich council seem to never enforce restrictions, the new paving will become a car park on day one. 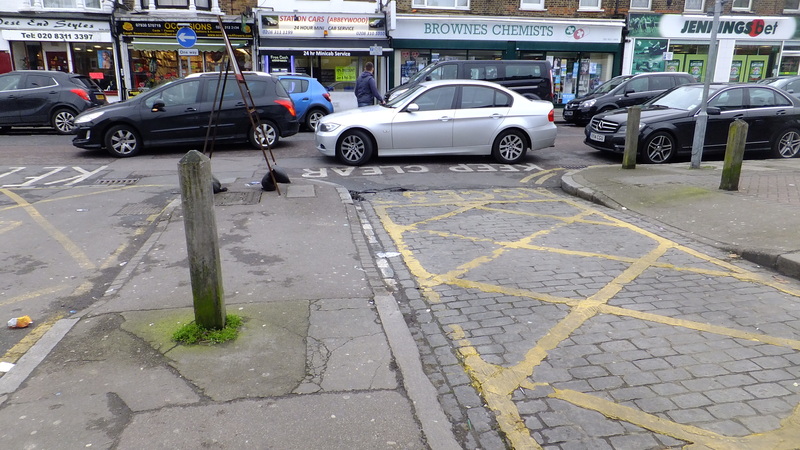 On the subject of parking, shops on the parade to see 300k complain that Bexley council are extremely overzealous, which they are, and yet Greenwich council do nothing to stop people double parking, blocking roads and taking spaces for hours at a time and more. Bexley-is-bonkers have covered the award here. He highlights how Bexley Council clean their side of the road daily. Greenwich’s is a mess and rarely cleaned. His latest post shows how Bexleyheath’s multi-million pound work on town centre streets has seen the road surface, comprising of small paving setts, falling apart within a year leaving messy areas of tarmac. Guess where some the £6m, that isn’t going on Abbey Wood’s shopping area, is going towards? Yep, putting the same expensive paving on the flyover road surface by the new station as seen at Bexleyheath. It’s a major bus stop and if they do that then the road surface will break under the weight. They’ve a couple of years to sort that out. The mention of shop fronts is good but they aren’t that bad along there. Helping retailers is a good step but really what can you advise a kebab shop to do? The parade currently has the usual dreary London high street mix of estate agents, bookies, takeaways and barbers. The only pub is shutting in a week. There’s some decent shops but I’m not sure what ‘advice’ you can give most. If they improve the physical environment thoroughly along the street then people, including tourists to the nearby camping site, may stop instead of rushing through. If it had been done years ago there may already be better things to visit. Further north are sites which could see thousands of new houses as part of the new housing zones. 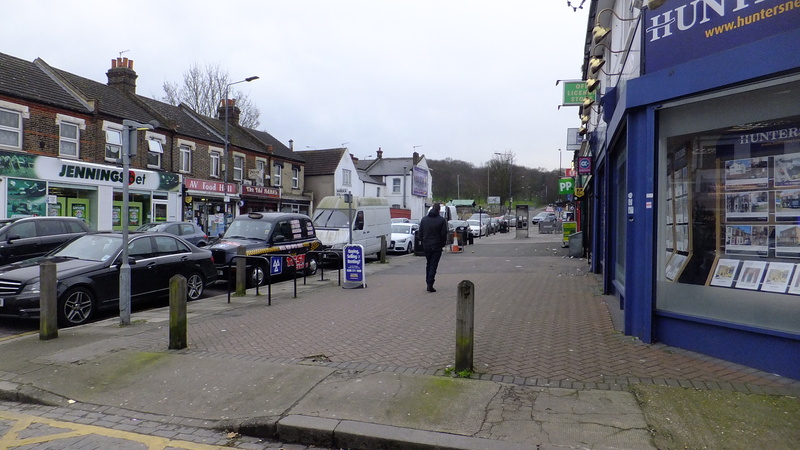 It’s not inconceivable to envisage a High Street appearing along Harrow Manorway in coming decades. Areas in red are commercial space, both existing and forthcoming. The area top right is part of Peabody’s plans, and exact layouts are unknown. If the areas in blue are redeveloped in future years and include commercial space, it could form an almost continuous shopping area. It’s a long way off but with thousands of new homes planned around there who knows? So the, the 300k is a decent start after the inexcusable oversight of not including Abbey Wood shops in the £6m Crossrail public realm improvement plan. Hopefully both boroughs can work together and are up to the task. It’s a small sum and some immediate improvements can be made for a very modest cost, which didn’t even need a bid, just simple maintenance and effort. Still, they’ve got the money so no excuses for at least the quick wins to be done. I hope they don’t blow most of it on consultations for a market in the wrong place leaving the road as drab as it is now. Plumstead needs some TLC too on its High Street. It’s a great shame even 40k couldn’t be won this time. However, a more pro-active council should hopefully win some bids soon. In the meantime some routine cleaning wouldn’t go amiss there, and there’s money to be used such as the discretionary 100k element of the millions the Mayor & GLA gives each year in Local Implementation Plans. A major scheme can be drawn up alongside. Will it be? Currently major scheme bids are coming for Eltham and then Greenwich. Does Greenwich need yet more millions when some places are in a far worse state? The past doesn’t bode well and this is a test of any real change under the new leadership. Brilliant for Abbey Wood but gutting for Plumstead High Street. I walk through it twice a day and it is depressingly disgusting and really lets Plumstead down. It is such a mess, really at the very least it would do with an industrial clean. I fully agree and we’re not talking big money to do that. When Greenwich suddenly found some money (ahem…) before the last election for cleaning some was supposed to be spent on high-pressure washers to clean up paving, walls etc. Lots of authorities own them but Greenwich never seemed to possess any, despite them offering ‘easy wins’ in terms of improving the look of a place. Not sure if they ever arrived but if so send them down to Plumstead. A couple of hours work and it’d look much better. I’m sure the council will come up with 1000 reasons why they can’t instead of doing it. The council did get some money for Plumstead over 10 years back but never maintained it. I expect the same with Abbey Wood. Chances of seeing new paving deep-cleaned after installation = very small. Much of the area to the west of Harrow Manorway near the top that you have bordered in blue is Thistlebrook where many descendants of the people who lived and owned land here before much of what is now north of the railway line existed. They had land compulsory purchase from them in the past and I sincerely hope that Thistlebrook remains as it is as long as its residents wish it to do so. It’s a very inefficient use of land though given the housing crises, located very close to a major transport interchange . If estates and areas of higher density are to be redeveloped then should that site be exempt? If a replacement were to include substantial amounts of truly affordable homes and suitable compensation / alternative sites offered would it stay? Does anyone know how this sorry state of affairs has come about in Abbey Wood. And do you have any suggestions as to where to go? Surely all the people who will move in to all these new developments will want somewhere to go for a few drinks? It’s a relatively recent phenomenon. Abbey Wood alone had at least 5 pubs until quite recently. One was a decent building that was locally listed, located near the station but fell behind the times. Some dodgy developers bought it and demolished. Its been empty ever since. Plumstead had far more too. Woolwich as well, and that had a few cinemas. So much closed that the area is now a shadow of what it was. Poor owners and a council that doesn’t know how to maintain areas people want to visit were (and are) big problems. Crossrail at least offers the chance of badly needed change.